Her name was Signe, a beautiful Jersey heifer that was one of two heifers I purchased this summer. Her pedigree was stacked with great type traits, and she had the potential to be a really great cow someday. The keyword here is had. In December, she went down one afternoon right after the first major cold snap of the year set in. After recovering from shipping fever not long after I brought her home, to always getting beat out for feed and water by the older and stronger heifer she shared a shed with, she was always getting the short end of the stick. By the time we got to her, it was dark and she was just about on her deathbed. 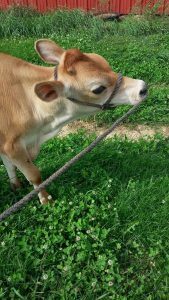 I remember running to the calf shed faster than middle school track and field day, taking her head in my lap, and screaming her name to keep her somewhat coherent until the vet arrived 45 minutes later. Four da ys later, by the grace of God, we were able to get her up and standing. I thought I was winning as a farmer, but it was the last time she got up. I, and Sam, fought for nearly seven weeks afterward by stretching her contracted muscles, lifting her in a sling and closely monitoring whatever we perceived to be a small victory in our endeavor to make this little Jersey whole again. 46 days later, on a Monday evening, we decided it wasn’t working anymore. Most rational people would have given up a long time ago. During those 46 days I kept rehashing stories of other prominent dairy cows that had gone down only to achieve great things, and wondering what I wasn’t doing enough of. Soon enough, I had other people telling me to just give it up and put her down already. I wasn’t strong enough. As I poured every ounce of blood, sweat and tears I had into making Signe better again, other aspects of my life began to suffer. I started feeling like my writing was no longer good enough and I wasn’t having enough faith in God to make things right on the farm. Most of all, I was giving it everything I can, and she was trying, too. But it just wasn’t enough. So, we concluded enough was enough and made the very hard decision to send Signe to a better place where she can walk and run again. That night, after milking, I went over by Signe, placed her head in my lap like I did that first night, and wept. I told her over and over again how sorry I was, that I loved her, and I hope she knew that we gave her everything we could to make her better. My husband, God bless him, took care of things after second breakfast the next morning. The grief I’ve been experiencing since that first night she went down has changed tones. It has moved from a place of fear to one of guilt and shame that I did everything I could and I still couldn’t make my animal better. The tide of tears and pain ebbs and flows, and rises and falls, like the ocean. If losing an animal doesn’t hurt, then maybe farming isn’t the right career path for you. I hurt every single time that an animal dies, but this one cuts deeper than all of those combined. I keep telling myself that I made the right decision and that I really did give it my all, but right now it hasn’t sunk in yet. I know that someday, hopefully soon, I’ll begin to believe that I did enough, that I’m strong enough to be a farmer, and most importantly, that I – as an individual – am enough.